Pro bono service is more than a requirement of many state bars: it's a foundational underpinning of the legal profession. Lawyers can uniquely serve their communities by sharing their time and talent with people of limited means as well as the charitable and nonprofit organizations that serve them. As you use your skills to help people in need, you gain the satisfaction of knowing you've contributed meaningful, quantifiable service to society at large. other individuals, groups, or organizations seeking to promote or secure access to justice. Emory Law students work 2–3 hour shifts at Atlanta Legal Aid in Decatur to assist with the intake of domestic relations cases. Trainings are once a semester; shift sign-up is on Symplicity. Are you seeking pro bono service? Georgia law prohibits law students (or any other individual who is not a member of the bar) from giving legal advice without the supervision of an attorney. This includes researching cases for other nonlawyers' use and drafting documents or pleadings. 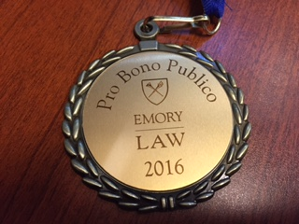 If you need legal assistance and cannot afford to hire an attorney, we recommend the following nonprofit and student organizations, with whom Emory students work in our pro bono and field placement programs under the supervision of an attorney. Please contact the organization directly for intake. Atlanta Legal Aid also maintains a list of other organizations in Georgia that provide legal assistance or information.